Is it real, or illusion? If you could magically turn your iPad into a much bigger tablet, would you? Fuhu is promoting its giant new Nabi tablets. (They're available in 24-, 32-, 43-, 55- and astonishing 65-inch versions.) 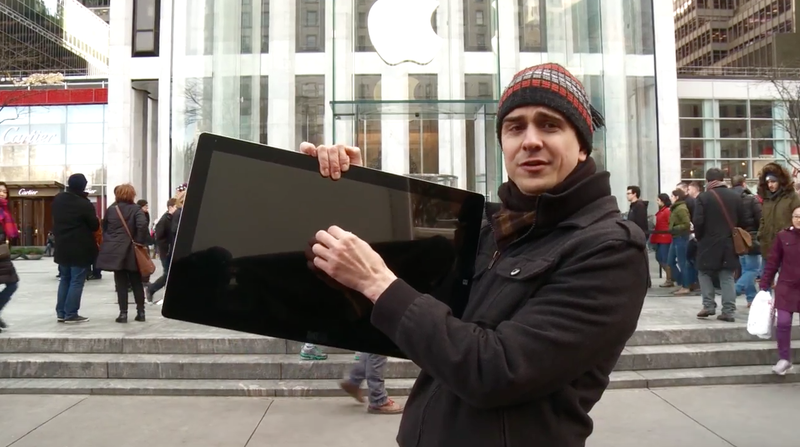 To that end, it made a new reality-style video featuring magician Adam Trent, one of seven stars in stage show The Illusionists, pretending to transform random people's iPads into Nabis, outside the glass-box Apple store on Fifth Avenue in New York. It's good, harmless, not-at-all earth-shattering fun, mostly offering a new twist on classic magic tricks, like Trent pretending to pull strawberries out of the popular video game Fruit Ninja—because duh, the resolution is just that good. But the best part is by far when that one little kid basically tells the silly magic man to take back some of these freaking strawberries, idiot, because there are too many, and what is he, some kind of fruit sherpa? As for the Nabi, we'll leave it to you whether you want to carry a TV around and pretend it's a tablet. Seriously, it's so big it has a handle—but maybe that just makes it cooler.